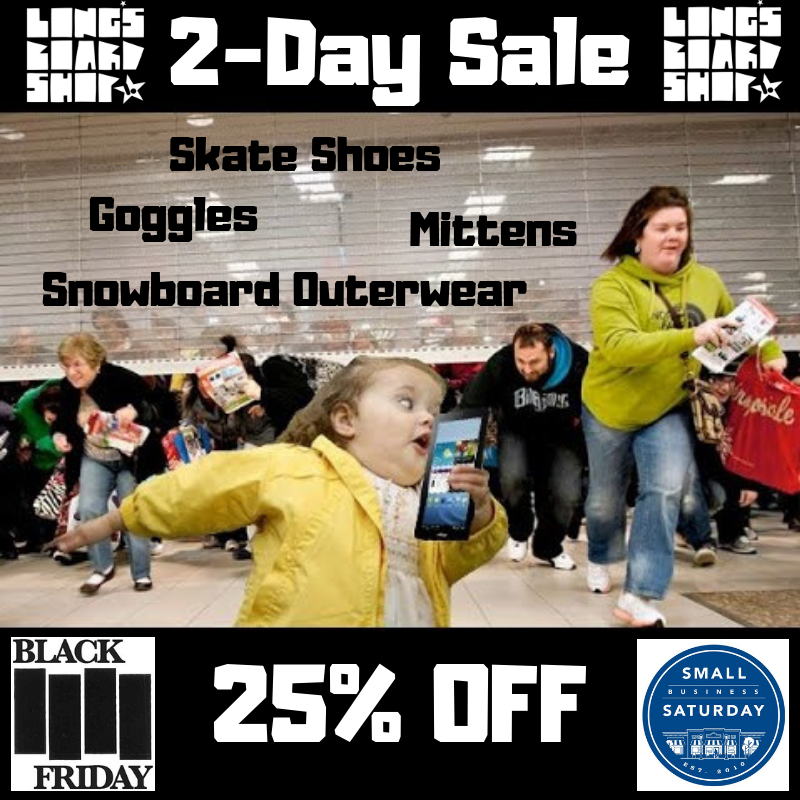 This year’s 2 - day sale celebrating Black Friday and Small Business Saturday will be: 25% off snowboard outerwear, goggles, mittens, and skate shoes. When you’re done knocking the turkey and cranberry sauce out of your fellow Mainers for that TV deal at the local box store, come here and relax to snowboard videos and the calming effect of a punk soundtrack as you save money on your snowboarding and skateboarding needs. Just like in the pit, remember to pick up the fallen. No one needs to spend the holidays crushed. LBS turns 6! Come join us on Sunday April 22nd to celebrate and also to participate in Element's Earth Day event. We'll have the ramps set up in the parking lot, run a sidewalk sale on stuff (including some shoes), and have our new collaboration deck with Element available (which will be contributing to kids getting to skate camp) (and use vegan friendly glues). Big thanks to everyone who's been a part of the shop over these last 6 years and to all those continuing to support us. We love what we do! Don't miss the annual maddness of our crazy Valentine's Day Sale! Blacker than a bear's tookus on a moonless night... it's Black Friday! And of course, Small Business Saturday. This year we're running deals on goggles, skate shoes, hoodies, and t-shirts, don't miss out. 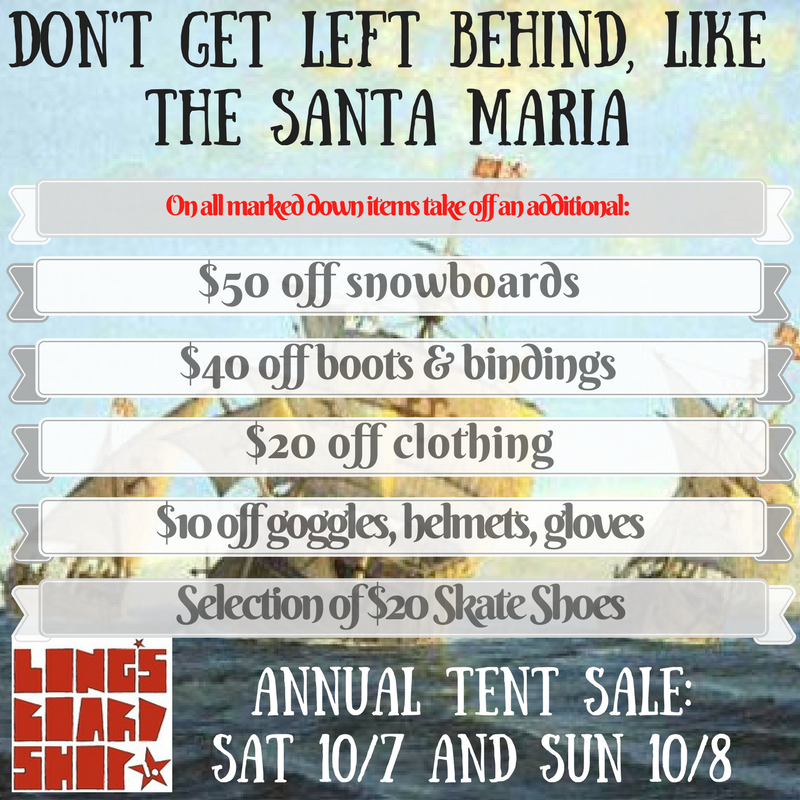 This Indigenous Peoples Day/Columbus Day (depending what town you live in) is our Annual Snowboard Tent Sale! Come check out this year's stuff that's rolling in on a daily basis and get even further savings on what's left from last year for Saturday and Sunday only.